I wonder how many of these will work on the CPC? Ports to connect being 464 (telnet), 664 (rlogin) and 6128 (SSH)! Same here, yet the embedded telnet client on the page worked fine. I noticed it connects through a proxy, so perhaps we can't connect to amstrad.simulant.uk because it is geo-blocked outside of UK? I have now given this CPC Telnet client a go. It seems to work well enough. I'm guessing telnet servers that make use of colour or special extended ASCII characters are impossible to view? I could connect, but later some garbage comes out. For now these are filtered out, but yeah we got only 2 colours in 80x25 (which is a pretty good terminal window size, I think), so colours is no go. I assumed jomicamp was also trying with a different client given the way he structured his command. Using the CPC, I WAS able to connect with your client Duke, but then, as you said, I got garbage characters appear and couldn't do anything. At last some time to test it. Chat with Mike, telnet my BBS and Pi, also wiki was great indeed. What's up with the scrolling there, how can I pause it? I will upload the video at night as it is 600+ MB. I managed to join irc with this painful method though. I tried to connect to http://bbs.fozztexx.com/ and this client doesn't seem to work as expected because I think it is sending CR LF and the server expects only CR (perhaps?). The server is new and experimental, so it could be also a problem on their side. Could it be possible to configure few things on the client? For example: only send CRs. For now it's very crude, but with all the links mentioned in this thread I have plenty to test with next time I find a day to work on it. My 2.0.4 Board on my 6128 run's this Telnet software OK, i can access the Wiki Telnet page as a test. I have to confess Telnet passed me by at the time. I did dabble with Compunet on the C64 but that didn't last long when my Dad got the Phone bill . Is there some specific Amstrad "sites" to have a look at and how does the whole chat thing work? i can remember logging into Compunet and being in a chat room. I imagine it's like that. When using telnet, does anyone else get a black screen... I noticed someone below mentioned they had a problem a while back, did this ever get resolved? I had the same problem, and I fixed it by copying the file manually into the SD card. In my first attempt, I had downloaded the client into the M4 using |httpget, and the resulting telnet.bin file was missing some bytes. I didn't investigate it further, so no idea what happened there. That worked! Thank you, I played a good game of chess online, very basic looking, but highly intense once you understand the controls, unfortunately unranked as couldn’t work out how to sign up. Anyone got R-Type 128k working on the M4 board yet? 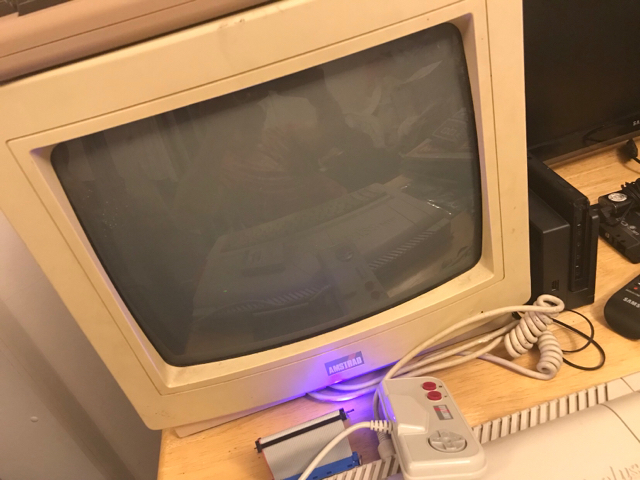 Currently users have accessed the Amstrad BBS with Pace RS232 and other hardware/software - but to use it on the M4 would be fantastic for a lot of users. So what we really need next is an ANSI BBS terminal package or more fully featured telnet client to get everything working that works with the M4 board. I did hope to try work on one myself but haven't had much time and also I've not done much Amstrad coding (other than when I was 8 out of the back of Amstrad Action etc!!). Great work though Duke, if you get a chance to test with the Amstrad BBS at amstrad.simulant.uk:464 let me know, I can always help with anything you need to know or hopefully aid in debugging etc. Another thought that may be easier is if a driver for the m4 could be made to emulate the pace rs232 connection. So when you load Ansiterm / EwenTerm / Honeyview / Honeyterm or other existing Terminal emulators that are already out there on CPC, they think the wifi connection is the serial connection? Then software from back in the day could be used to logon to the BBSes with the M4? How cool would that be???! I will give the source a quick clean next week and put it up. Another thought that may be easier is if a driver for the m4 could be made to emulate the pace rs232 connection. I don't think it will be straight forward to do, but I'll take a look. Feel free to use for whatever you wish. Would be great if someone improves on it.. Otherwise I will have to re-visit it some day. Great that you've put the source up, much appreciated! Oups, I uploaded the binary without amsdos header Fixed now. Not that of a long shot. It can take a bit though, because he's usually quite busy. Let's try summoning @Prodatron ! Page created in 0.244 seconds with 106 queries.